Painstakingly recreating every detail of the original station, built in 1866, a conservation architect restored the building to its former glory, including the installation of a replica of the carriage used by Queen Victoria – one of the few artefacts to survive the fire. Visitors to The Carriage can enjoy an informal lunch of soups and sandwiches in the bistro, coffee and cake in the café, or afternoon tea – with or without champagne – in the wood-panelled tearoom. In the evening, the bistro’s dinner menu features British classics made from local seasonal ingredients, such as haddock in Deeside batter, Aberdeen Angus steak, and sticky toffee pudding. The bar serves craft beer, wine and spirits, and a private dining room is available for hire, seating up to ten guests. The launch of The Carriage, which is joined in Ballater Station by a VisitScotland information centre and the relocated local library, is part of a wider initiative by The Prince’s Foundation to energise the local economy, creating new opportunities for residents and attracting tourists to the area, which was hit hard in the aftermath of the flooding caused by Storm Frank. 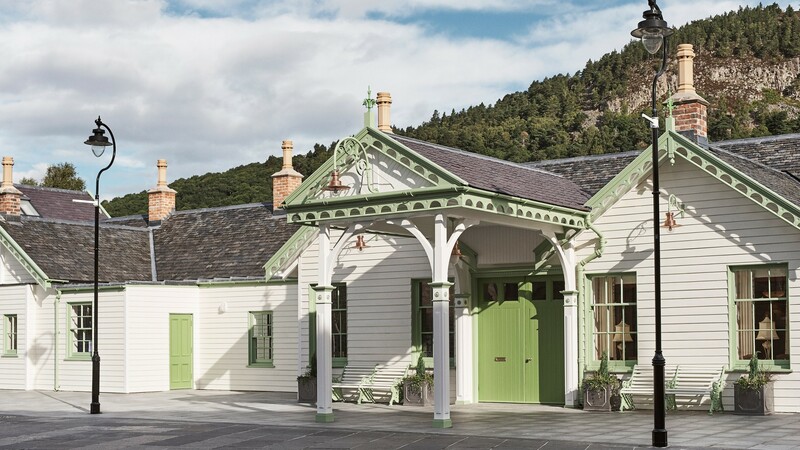 The award-winning Rothesay Rooms restaurant, opened by The Duke of Rothesay last year, has already brought thousands of tourists to Ballater, and The Carriage is now ready to pick up steam and follow its impressive lead.